Gestures: Finger drag, flick left/right with one finger, flick down/up with one finger, double tap, flick left with three fingers, 'touch and hold'. Get started on your programming journey today! With Ballyland Code 1: Say Hello, children who are blind or have low vision can learn basic coding concepts and skills that will be applicable to any programming language. Get introduced by way of the Tutorial game ‘Play with Coding’. Then take on your first Coding Challenge with simple coding commands. Make Wheelie, the little car from Ballyland, move around a digital game grid, on a mission to say Hello to Tinkleball. 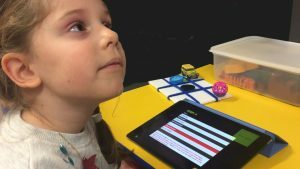 Audio description and great audio effects are at the core of this innovative app, creating unique accessibility for learners with visual impairment, including adults who are keen to find out what coding is about. 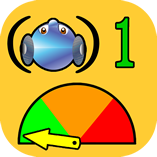 This is the first in a series of Ballyland Audio Based Coding apps. Tip 1: prepare iPad/gesture skills with Ballyland Stay Still, Squeaky (game with finger drag), Ballyland Magic (finger gestures including double tap), and Ballyland Sound Memory (navigating a digital grid). Tip 2: For the Coding Challenge, it is strongly recommended to use a tactile game grid, targets and obstacles. The 3D printed Ballyland tactile grid and miniature Ballyland characters and 'obstacles' have been specifically designed to support learning with the coding apps. Print in 3D yourself, or ask your school or organisation. You can purchase the package of 3D files from here. Of course you can also create your own tactile game grid. For instance, by sticking Wikki Stix on a piece of cardboard, and using a mini toy car, a small ball and for instance the lid of a milk bottle as a ‘pond’ and something else as the rubbish bin. A tactile resource can also be constructed with LEGO or DUPLO blocks and figurines. Share your ideas and we will post them here!